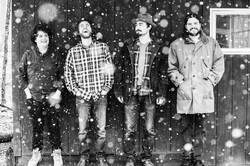 Since forming in late 2013, Americana & Folk Rock band Wise Old Moon has been honing their sound and showcasing their distinctive brand of roots music in the clubs and music halls of the Northeast, all the while building a loyal fan base. Wise Old Moon draws on inspiration from traditional folk influences like Woodie Guthrie, combined with a modern country-rock energy and sound. Wise Old Moon was recently voted as “Best Americana” and “Best Traditional/Folk” in the 2015 CT Music Awards, and is currently working on a second studio album which is due in the fall.